During the critical days of the War of Independence, the press supported the freedom fighters, although by no means it was free. Indeed, with the advent of the Company rule, it lost all the freedom and independence it had enjoyed during the Mughal rule. The English newspapers published in the Sub-Continent were both, weekly and daily. But these English newspapers were owned by “Anglo-Indians” or Britishers. So naturally, they supported British government on "every-national or international issue. They opposed the British government only if they'had any personal problem with the British government. Otherwise, they were the supporters of the British government. All the local newspapers which were published in the local languages of Sub-Continent were weekly newspapers, published round about 6,000 and 30 to 40 thousand readers. Urdu local newspapers were owned mostly by non-Muslims. It was the reign of Bahadur Shah Zafar. So in Delhi, all the newspapers were owned by Muslims but these papers were very few although they were the supporters of the Muslim King. was weaker and it was not in the condition to support the Muslims and their newspapers while many newspapers even were given the financial aid by British government so they could not displease the British government. Pen-newspapers were handwritten newspapers which were distributed among the readers or sometimes a person loudly read the newspaper by standing on a particular place. In 1800, a person had issued pen-newspapers in great numbers for the purpose of gaining the favour of people against the British government. Pen-newspapers played a very important role before the War of 1857. They developed hateful feelings among the people and realized them that the only way of living freely is to be rescued from the British government, otherwise they will become the slaves of Britishers. Pen-newspapers criticized the government very frequently. They criticized the British government along-with the officials of the British government. Mutiny was the soul of pen-newspapers and it was included in their objectives to prepare the people for war with Britishers and get their country free from the hold of Britishers. Effects of pen-newspapers can be known by the statements of British officials. By analyzing these statements, we can understand easily the effects of pen-newspapers over the British government and the people of Sub-Continent also. In the beginning of 1857, prejudiced attitude of the English press came on the surface. It demanded to curtail the ‘freedom’ of local press. When the War of Independence started, English press claimed that it was the result of that freedom which local press enjoyed. The English owned press displayed the worst type of racialism and openly raised the cry a [a guillotine against the freedom-fighters and the vernacular press, particularly the Urdu press and the Persian press. Lord Canning did not disappoint them. While promulgating the Press Act of 1857, he condemned the Indian newspapers and complimented the European press for their loyalty and intelligence. Governor-General of India Lord Canning enacted a law, by which every newspaper and journal had to obtain a license from the government. The government had the authority to cancel any license. Also, the government acquired the right of censorship by this law. ‘Sultan-uI-Akhbar' and one owned by the Hindus, ‘Samachar Sudh Darshan’ were prosecuted. Murtazai, from Peshawar, was alleged to had published a false news item. This paper was banned and the editor was imprisoned. "GuIshan-e-Bahar", a Persian newspaper from Calcutta, was also banned and its printing press was confiscated. Two newspapers from Lahore were ordered to be censored before publication and “Chashma-e-Faiz" from Sialkot. Riaz-ul-Akhbar was censored and later on banned. This newspaper was published from Multan. At that time, Delhi was not under the rule of Britishers. Newspapers from here propagated the noble cause of the Indians. They kept the public informed about the progress of war. They helped freedom fighters to a great extent. The three main newspapers from Delhi were “Sadiq-ul-Akhbar", "Delhi Urdu Akhbar” (Urdu) and Siraj-ul-Akhbar” (Persian). Siraj-ul-Akhbar was the Court gazette of Bahadur Shah Zafar. At the end of the war, all these newspapers were closed down. Maulvi Muhammad Baqir, the owner of the Delhi Urdu Akhbar, was shot dead. After the war, the Muslims were especially victimized by the Britishers and the Hindus came closer to the government. They set up their own presses. In 1853, the total Urdu newspapers were 35 and, in 1857, this number was reduced to only 12. Out of them, six were old and six were new. From these 12 newspapers, only one newspaper was owned by a Muslim. During War of Independence, Anglo-Indian press was free of any restriction. It was kept inciting the government to take revenge from the natives. Its attitude towards local press was very provocative. Editorials and columns of Anglo-Indian newspapers were harsh and objectionable. In short, Anglo-Indian press was given free hand to write what it wanted. The English-owned press displayed the worst type of racialism and openly raised the cry and hatred against freedom fighters and the vernacular press, particularly the Urdu and Persian. Lord Canning did not disappoint them. While promulgation the Press Act of 1857, he condemned the Indian newspapers and complimented the European press for their loyalty and intelligence. 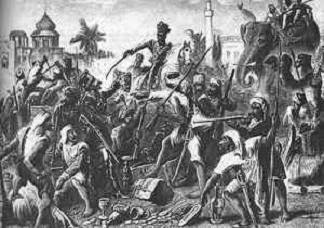 During the War of Independence, Muslims were the main point of British and Hindus victimization. So during this period, Muslim press was facing bad times. Maulvi Zakiullah blamed the press and the palace for the conspiracy. He has used highly derogatory language for the freedom-fighters and the press of Delhi, particularly, "Sadiq-ul-Akhbar" edited by the Syed Jamiluddin and “Delhi Urdu Akhbar” was edited by Maulvi Muhammad Baqir. Both the paper were closed down. Maulvi Baqir was executed while Jamiluddin was jailed for three years. Murtzai (Peshawar) and Riaz-e-noor (Multan) were banned, Munshi Dinan Chand, the Hindu newspapers magnate of Sialkot was only asked to transfer his establishment to Lahore. By the middle of 1857, the Muslim press was completely wiped out.